Serious gamers on a budget can delight on the sub-$1,000 Asus Republic of Gamers G46VW powered by a 3rd generation dual core i5-3210M clocked at 2.5 GHz and supported by an 8 GB DD3 system RAM. Its graphics is driven by an upper midrange GTX 660M graphics engine with its own 2 GB GDDR5 that enables it to play just about all the demanding RPG and FSP games at medium to high game settings. The G46VW’s price point advantage is due mainly to its 14-inch LED-backlit screen (with 1366 x 768 HD resolution -, the first 14-incher in the Asus RoG line. With a 5.5-ln weight, it comes with a 750GB SATA drive running at 5400 rpm and no optical drive and a host of standard wireless and wired data connectivity. A smaller footprint for gamers who prefer to move around more conveniently is obviously the selling point of the Asus G46VW with its light 5.5 lb weight. Configuration flexibility appears to be another advantage of the Asus G46VW. Consumers can choose between two 3rd generation Intel Cores – a dual core i5-3210M or a quad core i7-3610QM, both with Turbo Boost . System RAM can also be configured with an 8 GB RAM upgradable to 16 GB DDR 3 running at 1600 MHz. Clockspeed can be boosted anywhere from 2.7 GHz to 3.7 GHz. depending on the processor used. Depending on the configuration, this Asus is offered at an introductory price point of $999 (discounted to $949), all the way up to $2,400. The Asus G46VW reviewed here is the first ever Republic of Gamers laptop with a modest 14-inch screen size. All the rest in the RoG line sport 15” and 17”screens. The result is a sub-$1000 gaming laptop that is clearly another selling point for what is considered the most affordable RoG laptop. But its more interesting aspects lies under the hood which puts the model at par with many in the RoG line as well as many high enders costing more, if not for the modest screen. The Asus US Republic of Gamers G-Series is a line of high performance gaming laptops that can hold its own against several laptops designed specifically for gamers from other brands. These are essentially top-of-the-line laptops whose CPU and GPU have some of the highest computing prowess that can meet the demands of playing sophisticated game titles as well as 3D and video editing works. Serving as an entertainment center is the least of your worries when owning a gaming laptop. The nice thing about the Asus G series is that it also has models that can delight the budget-conscious gamers who don’t mind minor performance compromises but without disabling their ability to play the most demanding games. Buy a refurbished machine here. The ASUS Republic of Gamers G46VW-BHI5N43 Beast Review,Comparisons and Benchmarks! The Asus G46-BHI5N43 reviewed here is powered by the Intel Core i5-3210M which is ostensibly the most commonly used Ivy Bridge CPU in most recently released mid-range laptops. The 35 Watt 3rd generation TDP (Thermal Design Point) dual-core CPU is clocked at 2.5 GHz and showed no problems performing at a boosted speed of 2.9 GHz from its Turbo Boost technology as exhibited in our tests. On power-saving modes, the dual chore processor idles at around 1.2 GHz. The CPU comes integrated with the Intel Graphics HD 4000 that allows conserving battery power on less demanding games or office productivity tools and uses a graphics switching technology from Optimus that allows users to switch to the dedicated GPU for the more graphics-intensive demanding games. Table 1 below shows that the Asus G46 performance in terms of compute-intensive tasks thrown by the PCMark7 benchmark has negligible difference with others in the test. Even the older i7-2630 dual core processor is only slower by less than a percent. This serves to confirm that Ivy Bridge dual core i5-3210M performs just marginally better than the former Sandy Bridge architecture of the i7-2620M, the leading dual-core predecessor. But it is interesting to note that same dual core on a Samsung laptop is faster by 1.5%. The PCMark 7 test registers a relatively low 2707 score and this is attributable to the slow data transfer rates on its 5400 rpm hard drive. 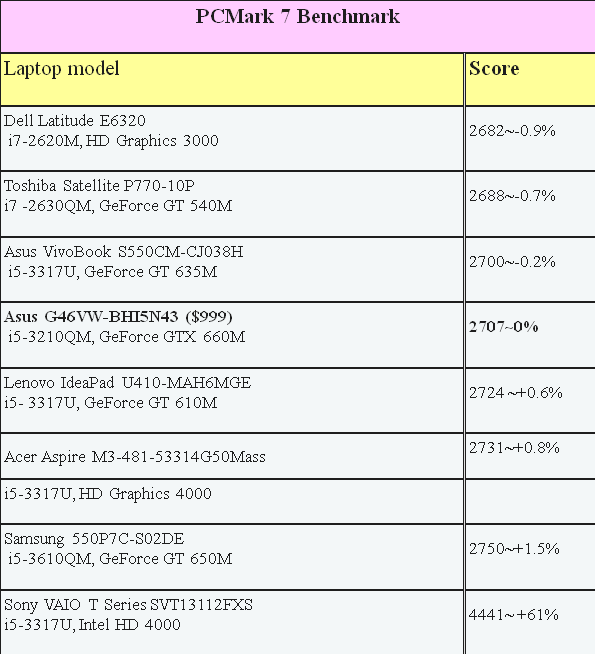 The same sized IdeaPad U410 using a less muscled i5-3317U (in the Ultra Low Voltage or ULV range) and GT 610M graphics registered a marginally higher 2724 points. In addition, the Sony Vaio SVT13 with a smaller 13.3-inch screen and powered by the same CPU and an even less powerful Intel HD Graphics 4000 scored a higher 4441 points. In both cases, the use of a solid state drive made the difference. Gamers accustomed to laptops with SSDs will no doubt notice the performance lag on the Asus G46VW using typical office productivity apps. The G46VW graphics is powered by an upper mid-range DirectX 11.1 compatible Nvidia GeForce GTX 660M introduced during the first quarter of 2012 and is among the fastest graphics card using the Kepler architecture built on the GK107 platform and using 28 nm manufacturing technology. It is however at the bottom rung of the GTX 600M series with the 680M in SLI mode at the top. Using an external GDDR5 video RAM, the GTX 660M is faster than the GT 650M using DDR 3 and is almost at par with the competing AMD Radeon HD 6950M. 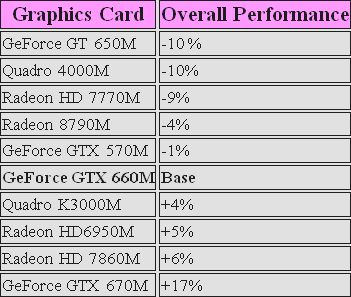 For those interested to know the relative graphics rendering muscle of the GTX 660M, Table 2 below shows its place with other GPUs currently used by most gaming laptops in its price range. The GTX 660M uses a 128-bit memory bus and can only support a maximum of 2GB GDDR5 video RAM. The GPU core is clocked at its maximum setting of 835 MHz, while the VRAM clockspeed is set at 1250 MHz. This Kepler based GPU is more commonly used in larger 15.6-inch gaming laptops such as the Asus G55VW and the Lenovo IdeaPad Y580, making its implementation in the 14-inch screen G46 significantly more prominent. The GPU idles at 135 MHz at the core and 202.5 MHz for the memory and reaches a peak of 950 MHz for the core and 1250 MHz for the VRAM. 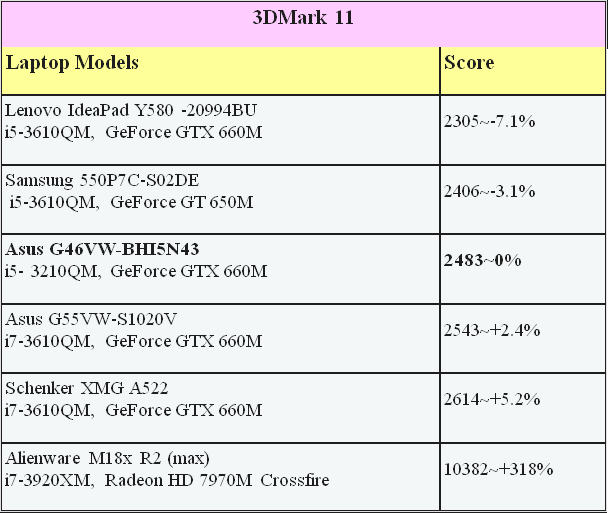 Take note in Table 3 that the Samsung 550P7C that registered 1.5% higher on the PCMark 7 for the CPU-intensive benchmark test results shown in Table 1 figured 3.1% slower than the Asus V46VW when it came to the graphics-intensive rendering tasks on PCMark 11. This simply shows the superior video graphics performance of the GTX 660M over the GT 650M. In addition, the next two notebooks registering a slightly higher score proved that a quad core has marginal performance boost over a dual core laptop using the same GTX 660M graphics engine. And just to show the overall gaming muscle of the Asus G46VW in the context of what is possible today, Table 2 shows the Alienware M18x as having more than thrice the gaming muscle when using quad core and the top of the line HD 7979M Crossfire-configured GPU. The default screen resolution of 1366×768 allows 720p displays that enable all the demanding RPG and FSP games released in 2012 to play seamlessly at medium to maximum game settings. The NVidia GeForce GTX 660M with its 2 GB video RAM was able to blast through our typical medium and high graphics settings for the tested range of games. It was only Guild Wars 2 that fell below 30 frames per second (fps) at maximum game setting due mainly from the game’s high resource-heavy sampling algorithm. Even then, at the default 720p screen resolution, the GTX 660M can be a bit overkill for most PC games released since 2012. Storage: The G46 is equipped with SATA II Seagate Momentus750 GB rated at a standard 5400 rpm. Multimedia: It uses the Intel Panther Point HD Audio Controller, in-built stereo speaker system and a Webcam. Wireless connectivity: It comes with the Bluetooth 4.0, integrated WiFi 802.11 a/b/g/n and the dual band Centrino N 2230. Wired connectivity: It has three USB 3 ports, a 3-in-1 card reader and three display connection options for HDMI, VGA, and mini-DisplayPort. It also comes with a 3-in-1 card readers for SD, MC and MMC, an industry standard 3.5 mm headphone jack and microphone jack. The Asus G46VW is one such gaming notebook which, at its introductory price point of $999, is the first ever Republic of Gamers notebook with a modest 14-inch screen size. All the rest in the line sport 15” and 17”screens. But the more interesting aspect of the notebook lies under the hood which could put the model at par with many high enders costing more, if not for the small screen. Check out the cheapest deal on the market. Consumers can choose between two 3rd generation Intel Cores – a dual core i5-3210M or a quad core i7-3610QM with Turbo Boost and an 8 GB RAM upgradable to 16 GB DDR 3 running at 1600 MHz. Clockspeed can be set anywhere from 2.7 GHz to 3.7 GHz. depending on processor used. Its graphics is powered by an upper mid-range Nvidia GeForce GTX 660M with 2 GB DDR5 video RAM as well as a graphics switching technology from Optimus that allows users to switch to a battery conserving integrated CPU + GPU mode for less demanding games. 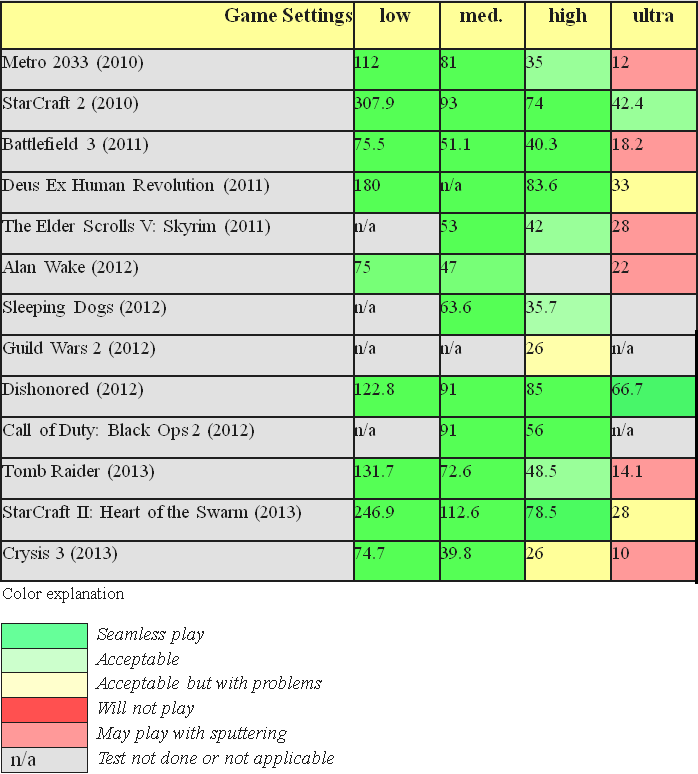 As a result, all the demanding games played seamlessly in medium setting like Metro 2033 and Crysis 3 while some like Star Craft 2, Elder Scrolls V, Deux Ex Human Revolution, Batman: Arkham City and Call of Duty: Back Ops 2 played well even in high settings. 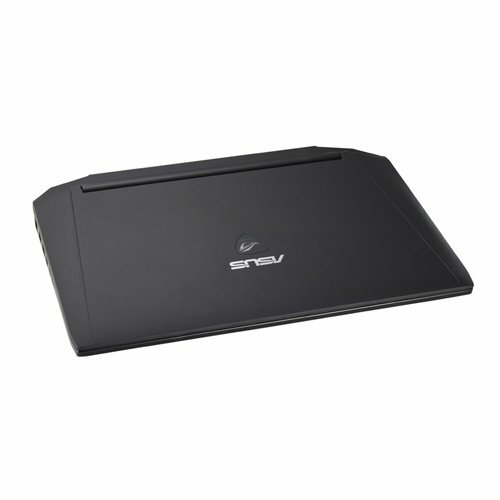 The G46 is bundled with 64-bit Windows 8 and is equipped with SATA II Seagate 750 GB rated at a standard 5400 rpm. Wireless data connectivity is served with Bluetooth 4.0, integrated WiFi 802.11 a/b/g/n and the dual band Centrino N 2230. It has three USB 3 ports, a 3-in-1 card reader and three display connection options for HDMI, VGA, and mini-DisplayPort. The matted screen comes with a standard 1366 x768 resolution which is typical of budget notebooks of this size. This is where the G46VW pales in comparison with the rest in the G-Series. The display is not as crisp and vivid as what is available in the series. Color accuracy is average which puts it at par with many low end notebooks. Asus has opted to give the G46 a small size trading off an optical drive. This may be fine for gamers who often play with online games, but you can always use an external optical drive. Battery life may be above average at an overall of runtime of over 7 hours with maximum performance mode registering 2 hours 15 mins. and a continuous online browsing over WiFi at 4 hours 11 mins. But the 6-cell Li-Ion battery is not user-removable, adding to the disposable nature of notebooks. Nevertheless, playing games on battery alone has shown dropouts in the frame rates. This clearly suggests that demanding games on the G46 should be played while plugged into the mains. Lastly, stereo sounds from its small speakers are rather thin and hollow as it lacks the subwoofer commonly found in the larger G Series. Its redeeming quality is that the sound is clear with minimal distortion at high volumes. The matted TN screen comes with a standard 1366 x768 resolution which is typical of budget notebooks of this size. While it has no glare to make it viewable in outdoor lighting conditions, and exhibits reasonably acceptable viewing angles from side to side, but not above or below the center which results in degraded brightness and colors, the G46VW slightly pales in comparison with the rest in the G-Series in terms of color vibrancy. Moreover, the display is not as crisp as what is available in many laptops at this price point. Color accuracy is average which puts it at par with many low end notebooks. Asus has elected to give the G46 a small footprint and light weight that trades off an optical drive. This may be fine for gamers who often play with online games, but you can always use an external optical drive. The 750 GB SATA II Seagate Momentus HDD as tested under CrystalDiskMark 3.0 showed average 72.8 MB per sec data transfer rate which is relatively sluggish compared to other laptops with SATA III drives which averaged 84.6 MB per sec even when running at 5400 rpm, while those running 7200 average 93.8 MB per sec. Battery life may be above average at an overall of runtime of over 7 hours with maximum performance mode registering 2 hours 15 mins. and a continuous online browsing over WiFi at 4 hours 11 mins. But the 6-cell Li-Ion battery is not user-removable, adding to the disposable nature of notebooks. Nevertheless, playing games on battery alone has shown dropouts in the frame rates. This clearly suggests that demanding games on the G46 should be played while plugged into the mains. Lastly, stereo sounds from its small speakers are rather thin and hollow as it lacks the subwoofer commonly found in the larger G Series. Its redeeming quality is that the sound is clear with minimal distortion at high volumes. Asus once again demonstrated that performance need not be severely compromised in a budget gaming notebook or in housing all that gaming muscle in a small laptop. The Asus G46 may have some drawbacks but tests have shown it to be more than able to play all the demanding games thanks to a wise pairing of low resolution graphics with near-high end GPU and quad core engine. Gamers who can overlook an average display quality and a built-in battery can look forward to a fulfilling gaming experience without straining their budgets. Check out the cheapest price on the market. This is the first 14-inch gaming notebook in the Asus G Line that offers near top of the line gaming performance below $1,000 thanks to its low resolution display.